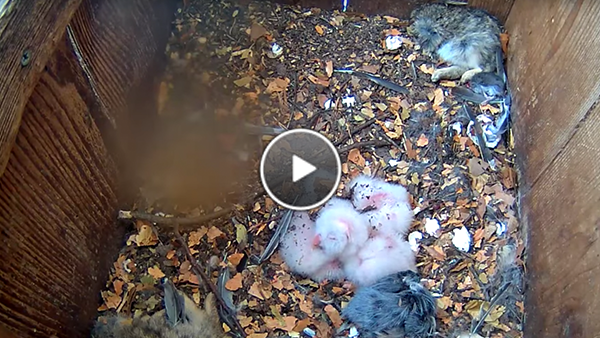 Watch the female Barred Owl unveil three owlets when she departs the nest box to pick up a chipmunk. On the Barred Owl cam, a trio of white, down-covered owlets are now officially the center of the adults’ (and viewers’) attention for the next month! The three white eggs hatched in succession on April 6, April 8, and April 9, after 32, 32, and 31 days of incubation respectively. Over the next 30 days, the adults will work tirelessly to provide the owlets with enough food to sustain their frenetic growth rate of nearly one third of their hatch weight (~15 grams) per day on average. Until the owlets are large enough to swallow whole food, the male’s job is to deliver everything from rabbits to songbirds to the female in the box, where she will parcel bits of prey into the hungry mouths of these soon-to-be hunters. Don’t miss a thing because they’ll be gone before you know it. Watch cam. 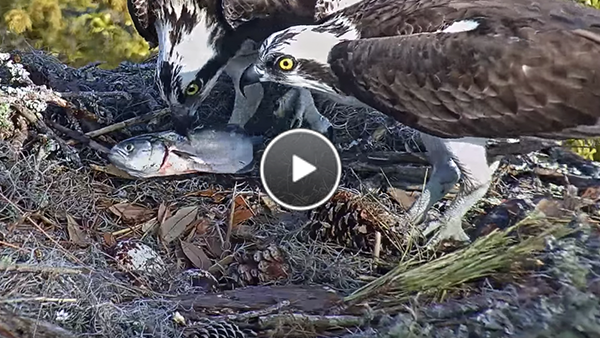 Watch the male deliver Ospreys’ favorite food—fish—to his mate in Savannah, Georgia. Atop their nest overlooking Skidaway Island, Georgia, the Osprey pair on the Savannah Osprey cam has been dutifully incubating their clutch of three eggs for 34 days. Now the pair’s hard work should begin to pay off within the next week as they prepare for the hatching of their first chick (the incubation period for Ospreys ranges between 35 and 43 days). Watch it happen live. The Ospreys haven’t had an easy go of it so far this breeding season. The fishing has been good, but there’s been high competition for viable nest sites and food in the area. We’ve seen the pair ardently defend their nest from other Ospreys trying to steal their fish, take over their nest site, or sneak in an unwanted copulation attempt. What will the future hold for these determined parents? Watch cam. 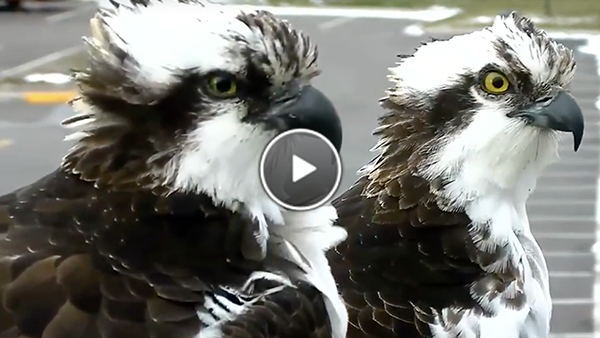 Watch Iris (left) and Louis (right) reunite on the Hellgate Osprey cam for the first time since returning from migration. In other Osprey news, the breeding pair from the Hellgate Osprey cam have returned to their nest in Missoula, Montana. Watch Louis and Iris reunite for the first time on cam since they started their migration south last September. Migrant Osprey pairs neither migrate together nor do they overwinter in the same area. Instead, breeding pairs typically travel alone to their Neotropical wintering grounds (as far south as Chile and southern Brazil). They reconvene at the nest site before the breeding season, with the male usually arriving before the female. This year, Louis was the first to arrive on cam on April 4, followed closely by his mate Iris on April 6. After unsuccessful breeding attempts in the past two years, 2018 will mark this pair’s third attempt to raise a chick to fledging. In the coming weeks, viewers will observe plenty of fish deliveries, copulations, and “nestorations” as Louis and Iris prepare for the arrival of their first egg. Watch cam. Click to share your favorite feeder bird experience from the Ontario FeederWatch cam for a chance to win big prizes! 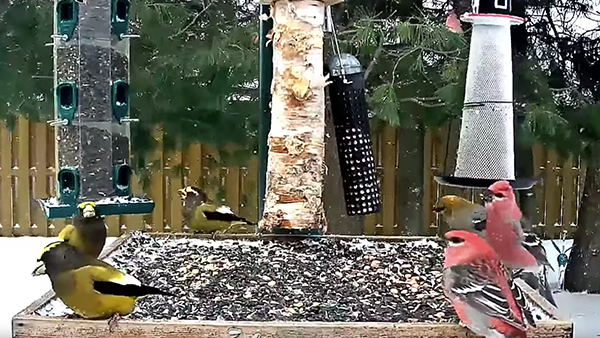 After months of fun, surprises, and plenty of finches, the time has almost come for the Ontario FeederWatch cam to wind down for the season. But before this eventful season comes to a close, we want to give you one last chance to win big prizes from Perky-Pet and Celestron! Whether it was witnessing dive-bombing crows, marveling at feeders full of colorful grosbeaks, or having a surprise visit from a Brown Thrasher, we want to hear about your favorite feeder bird experience, memory, or species, either on cam or in your own adventures. Submit your favorite experience. Since this is our last contest of the season, we have a special batch of prizes, including three Perky-Pet hummingbird feeders (to get ready for spring) and two pairs of Celestron Nature DX 8 x 32 binoculars (valued at $120 each!). We’ll randomly select winners from everyone who participates from now until the cam season closes on Sunday, April 22, and we’ll share some of our favorite submissions with the community!